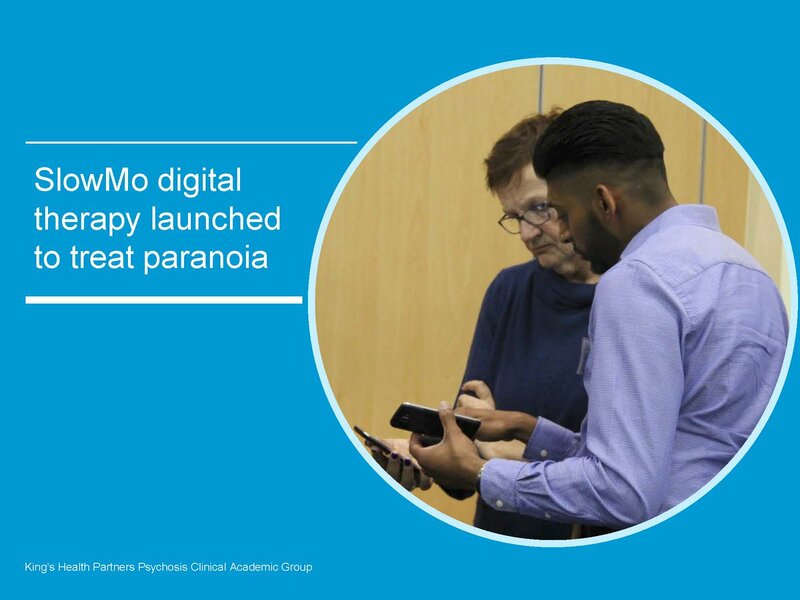 South London and Maudsley has launched a randomised controlled trial for SlowMo, the first digital therapy for paranoia, in London, Sussex and Oxford. Paranoid thoughts are one of the most common symptoms of severe mental health problems, and are associated with significant distress and disability. But pharmacological and psychological treatments have limited effectiveness, so innovation is urgently needed. SlowMo is the culmination of three decades of research, led by Professor Philippa Garety, Clinical Director and Joint Lead for the King’s Health Partners Psychosis Clinical Academic Group (CAG). This work initially found that fast thinking habits contribute to paranoia, and a talking therapy promoting slower thinking showed promise in helping people cope with their concerns. SlowMo is an easy-to-use, memorable and enjoyable digital therapy, a development led by Dr Amy Hardy of King’s College London and South London and Maudsley, in collaboration with service users, clinicians, inclusive healthcare designers and technologists. SlowMo works by supporting people to notice their upsetting worries and fast thinking habits, and then provides tips to help them slow down their thinking and cope with paranoia. It consists of eight face-to-face sessions with a therapist, assisted by a website with interactive stories and exercises. This synchronises with a mobile app for use outside sessions, extending the reach of therapy to people’s daily lives. Initial feedback about SlowMo has been very positive, with people indicating it has helped them manage their fears and get more out of life. The trial will determine whether SlowMo reduces paranoia, and if it works by improving slow thinking. 360 people with schizophrenia-spectrum diagnoses in total across three sites (120 from South London and Maudsley) will be randomly allocated to continue with their usual care, or receive SlowMo plus their usual care, and followed up over six months. If SlowMo is found to be effective, Professor Garety’s team plans to make it freely available in the NHS. The King’s Health Partners Psychosis Clinical Academic Group brings together the largest group of psychosis expert clinicians, researchers, academics and clinical staff in the world. For more information about the trial visit the SloMo website. The trial team, funded jointly by the Medical Research Council (MRC) and National Institute for Health Research (NIHR), will be recruiting participants from the Psychosis CAG at the Trust over the next two years.